Last Trends in Art Revision. 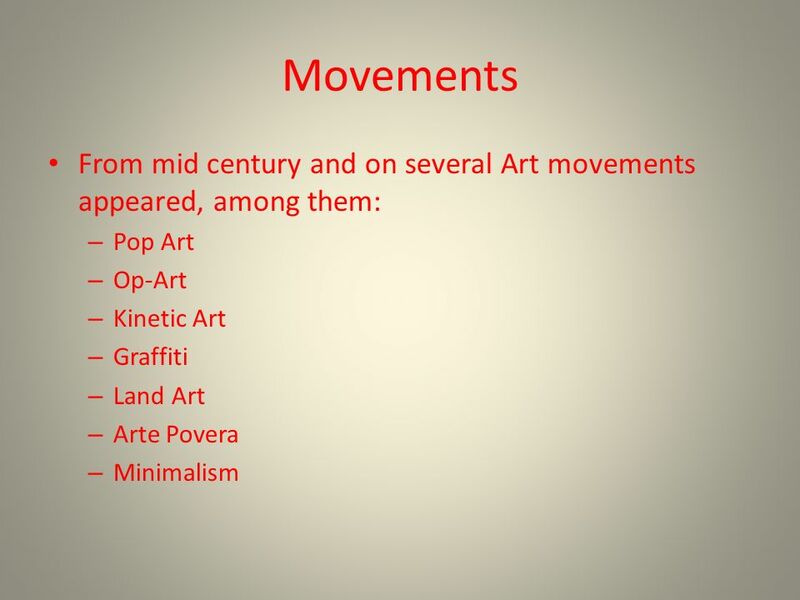 Movements From mid century and on several Art movements appeared, among them: – Pop Art – Op-Art – Kinetic Art – Graffiti. 3 Pop Art It is a passive conception of the social reality. It does not express the creativity of the popular classes but their non-creativity. The origin of the movement is in – Rauschenberg and – Jasper Johns, who are considered as Neo-Dadaists. Painting becomes again something that evokes. 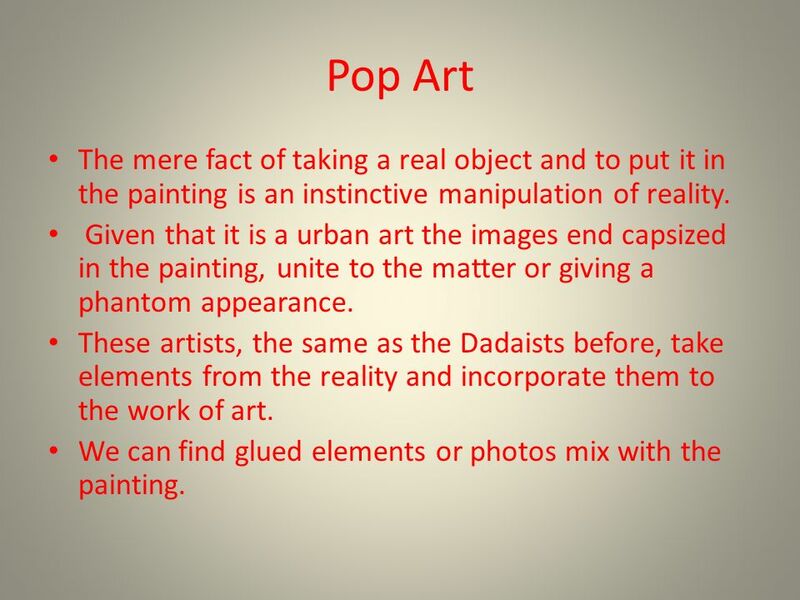 5 Pop Art The mere fact of taking a real object and to put it in the painting is an instinctive manipulation of reality. Given that it is a urban art the images end capsized in the painting, unite to the matter or giving a phantom appearance. 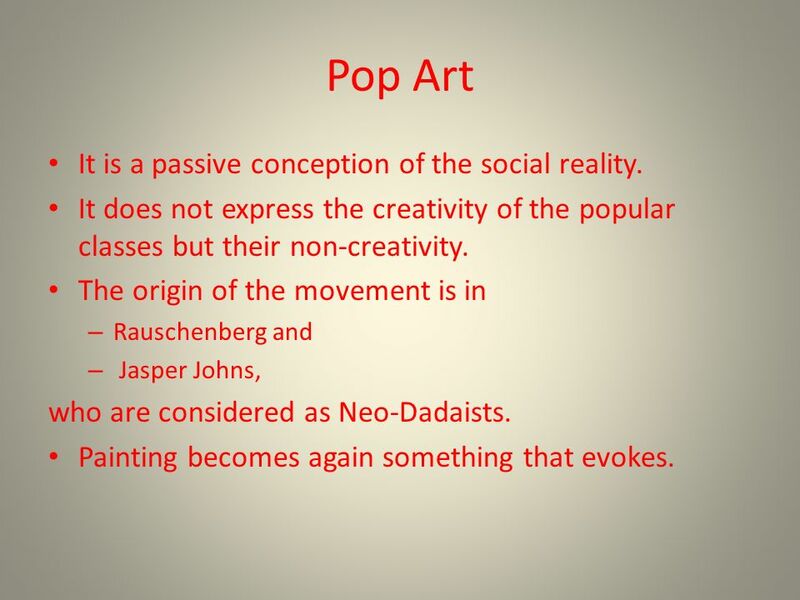 These artists, the same as the Dadaists before, take elements from the reality and incorporate them to the work of art. We can find glued elements or photos mix with the painting. 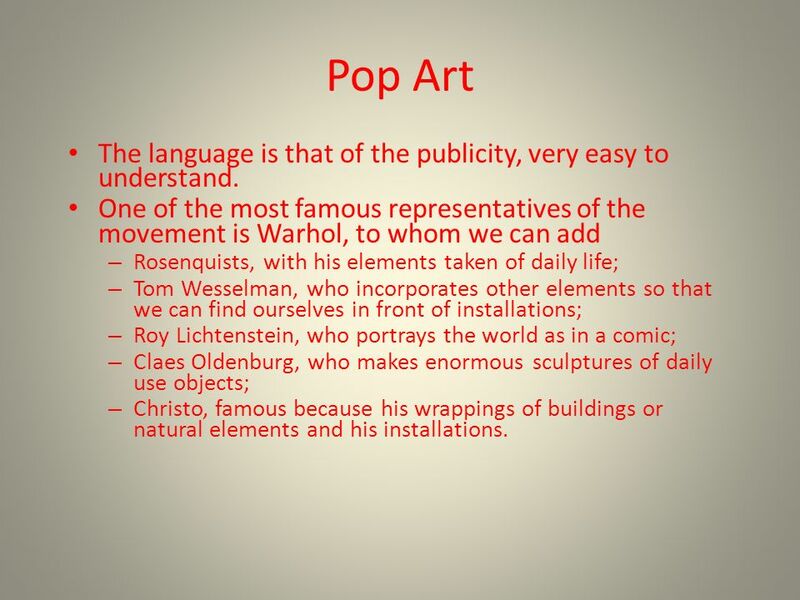 6 Pop Art The language is that of the publicity, very easy to understand. One of the most famous representatives of the movement is Warhol, to whom we can add – Rosenquists, with his elements taken of daily life; – Tom Wesselman, who incorporates other elements so that we can find ourselves in front of installations; – Roy Lichtenstein, who portrays the world as in a comic; – Claes Oldenburg, who makes enormous sculptures of daily use objects; – Christo, famous because his wrappings of buildings or natural elements and his installations. 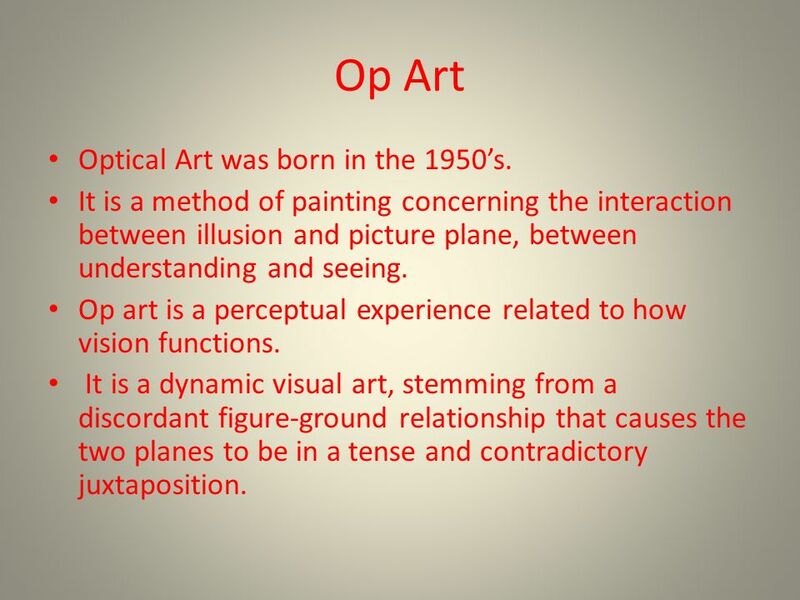 8 Op Art Optical Art was born in the 1950s. It is a method of painting concerning the interaction between illusion and picture plane, between understanding and seeing. 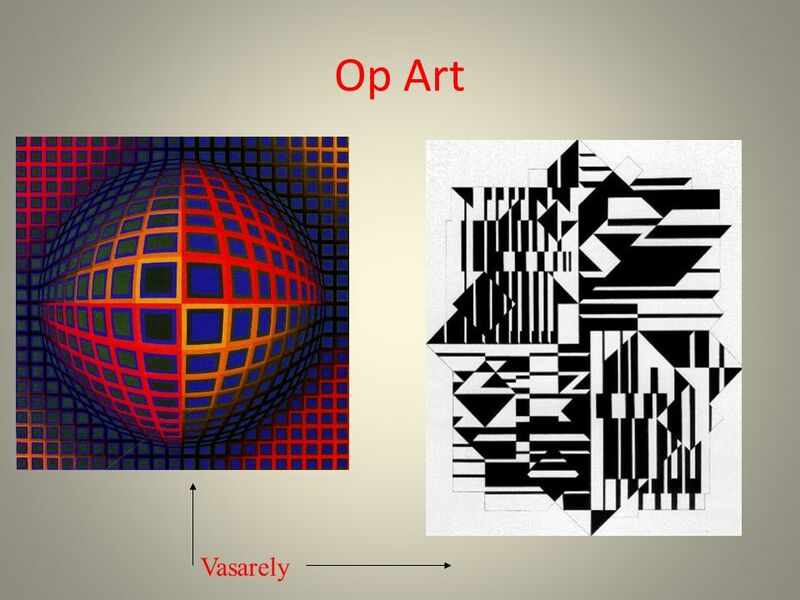 Op art is a perceptual experience related to how vision functions. It is a dynamic visual art, stemming from a discordant figure-ground relationship that causes the two planes to be in a tense and contradictory juxtaposition. 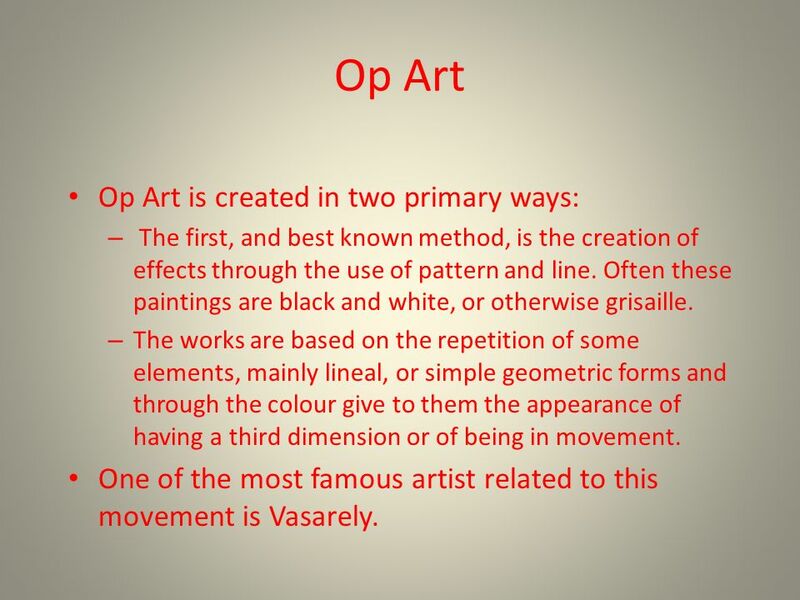 9 Op Art Op Art is created in two primary ways: – The first, and best known method, is the creation of effects through the use of pattern and line. Often these paintings are black and white, or otherwise grisaille. – The works are based on the repetition of some elements, mainly lineal, or simple geometric forms and through the colour give to them the appearance of having a third dimension or of being in movement. One of the most famous artist related to this movement is Vasarely. 11 Kinetic Art Kinetic art is art that contains moving parts or depends on motion for its effect. The moving parts are generally powered by wind, a motor or the observer. 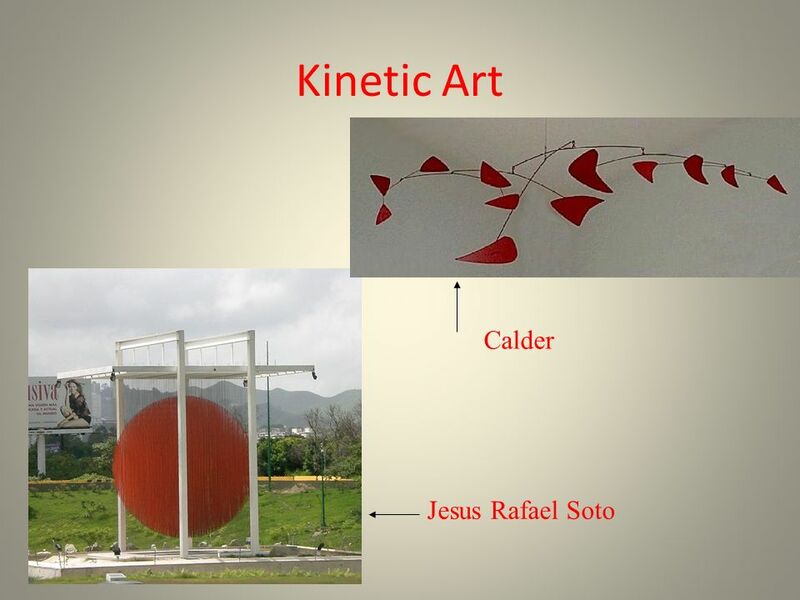 The term kinetic sculpture refers to a class of art made primarily from the late 1950s through 1960s. 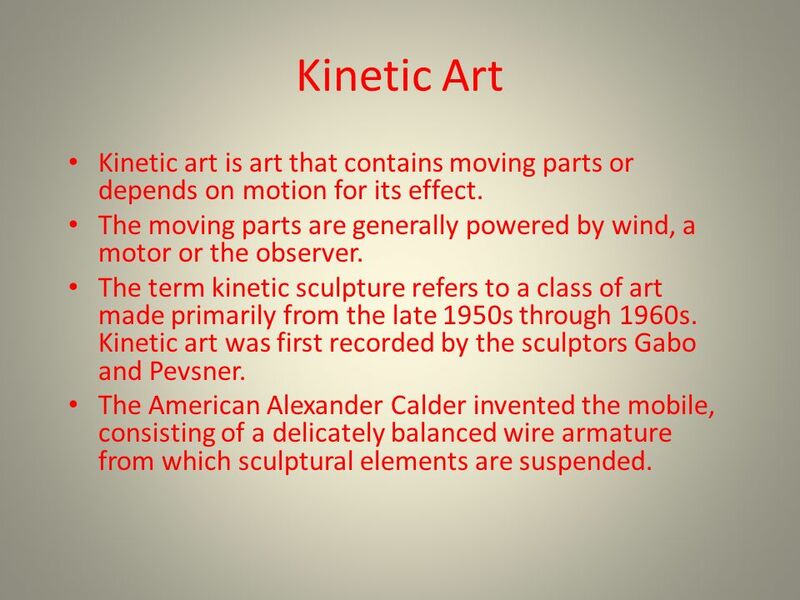 Kinetic art was first recorded by the sculptors Gabo and Pevsner. The American Alexander Calder invented the mobile, consisting of a delicately balanced wire armature from which sculptural elements are suspended. 12 Kinetic Art In common with other types of kinetic art, kinetic sculptures have parts that move or that are in motion. The motion of the work can be provided in many ways: – mechanically through electricity, steam or clockwork; – by utilizing natural phenomena such as wind or wave power; – or by relying on the spectator to provide the motion, by doing something such as cranking a handle. 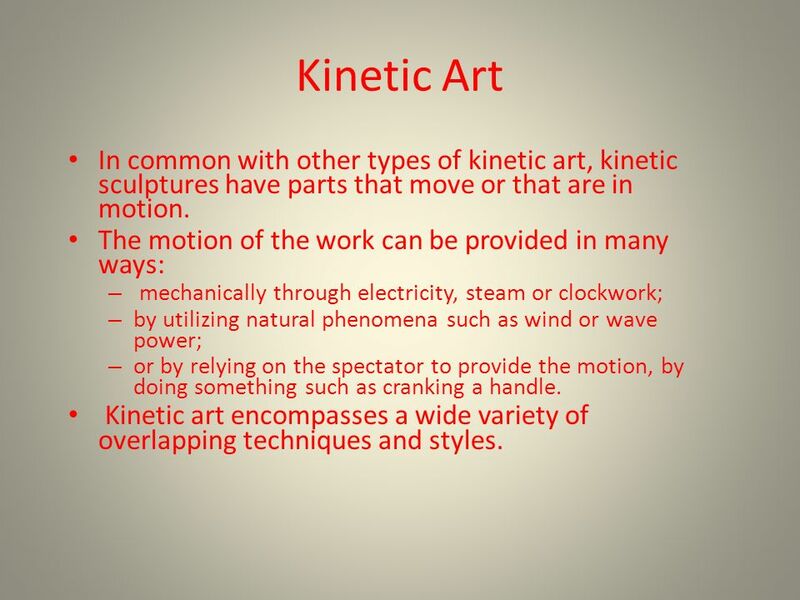 Kinetic art encompasses a wide variety of overlapping techniques and styles. 14 Graffiti It began in the 1970s. It is a type of deliberate marking on property that can take the form of pictures, drawings, words or any decorations inscribed on any surface outside walls and sidewalks. 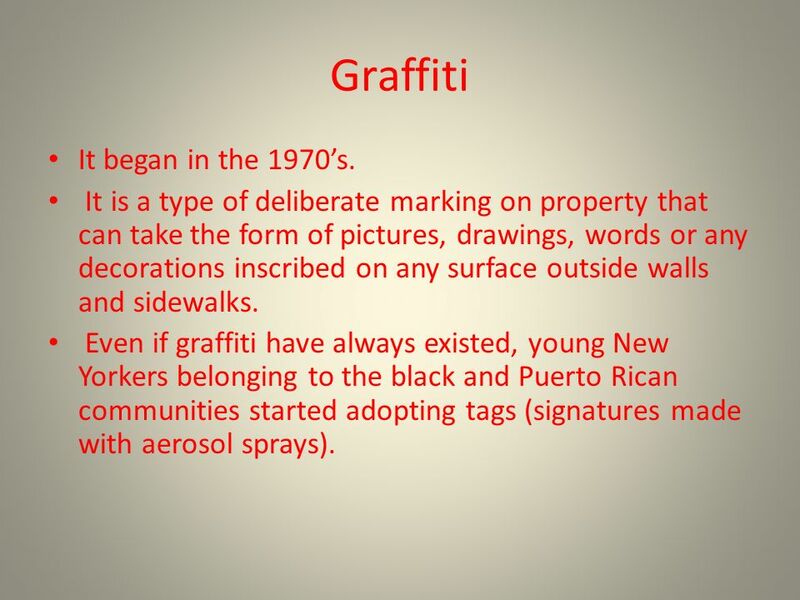 Even if graffiti have always existed, young New Yorkers belonging to the black and Puerto Rican communities started adopting tags (signatures made with aerosol sprays). 15 Graffiti The first modern identified tagged in New York was Taki, a Greek-American artist. At the same time, the graphs also made their appearance. These were real urban frescoes painted with spray- paint. 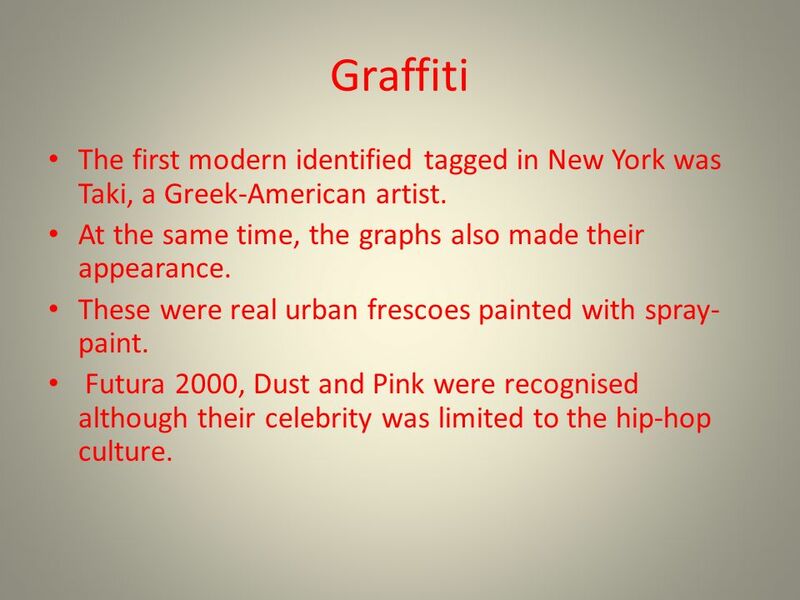 Futura 2000, Dust and Pink were recognised although their celebrity was limited to the hip-hop culture. 16 Graffiti Basquiat and Haring started to work in the street and the subway but their work was renowned and reputed. They won instant critical acclaim and attracted the attention of influential art dealers. 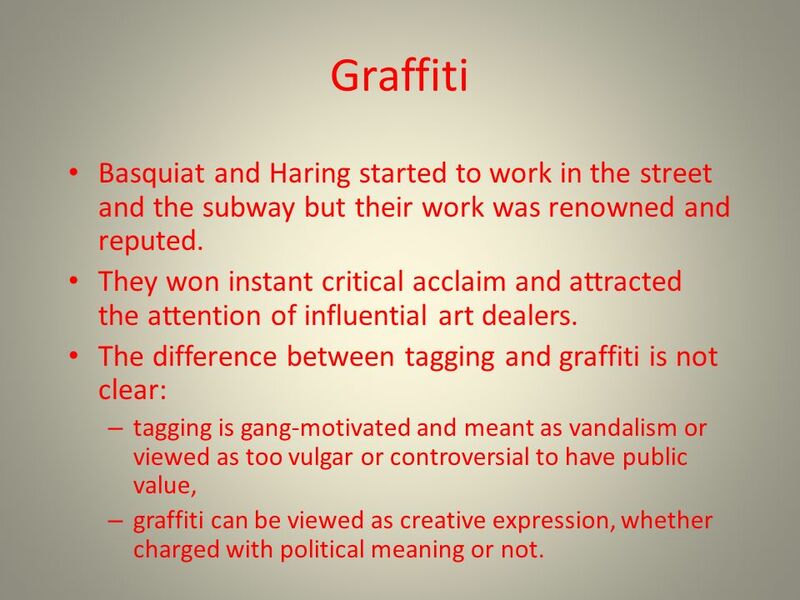 The difference between tagging and graffiti is not clear: – tagging is gang-motivated and meant as vandalism or viewed as too vulgar or controversial to have public value, – graffiti can be viewed as creative expression, whether charged with political meaning or not. 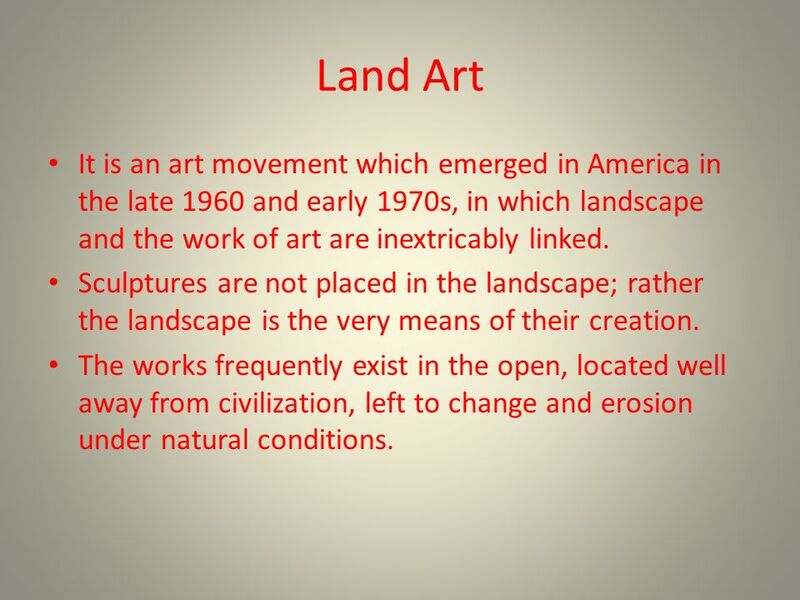 18 Land Art It is an art movement which emerged in America in the late 1960 and early 1970s, in which landscape and the work of art are inextricably linked. 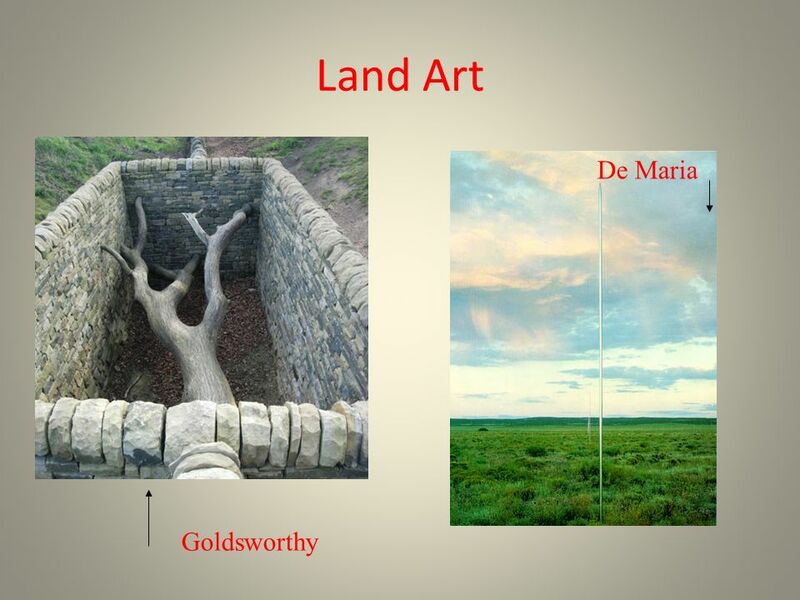 Sculptures are not placed in the landscape; rather the landscape is the very means of their creation. The works frequently exist in the open, located well away from civilization, left to change and erosion under natural conditions. 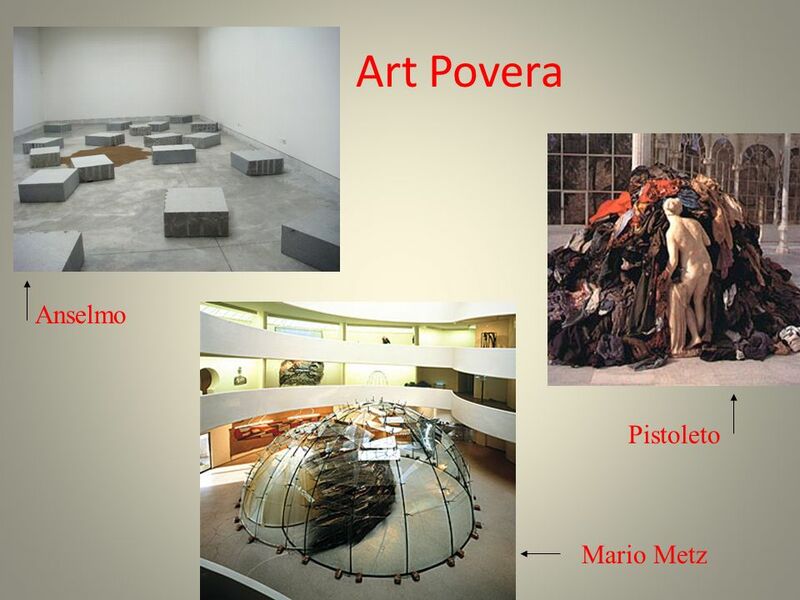 21 Arte Povera The term 'Arte Povera' was introduced in 1967. It provided a collective identity for a number of young Italian artists. They were working in radically new ways, breaking with the past and entering a challenging dialogue with trends in Europe and America. 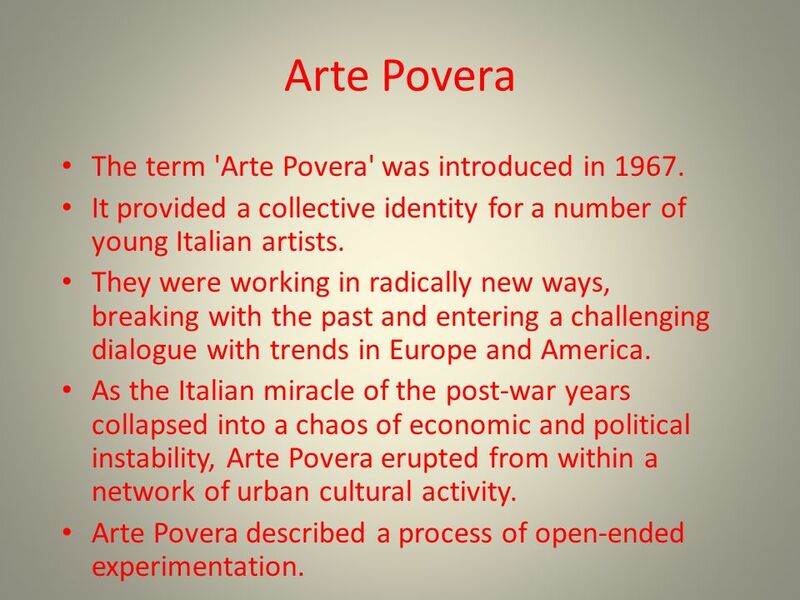 As the Italian miracle of the post-war years collapsed into a chaos of economic and political instability, Arte Povera erupted from within a network of urban cultural activity. 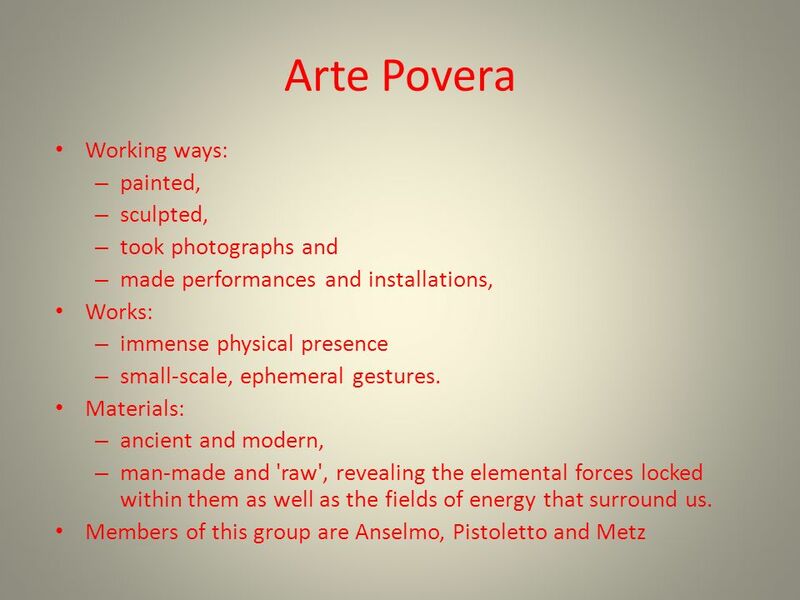 Arte Povera described a process of open-ended experimentation. 22 Arte Povera In the wake of the iconoclastic artistic innovations of Italian precursors – Lucio Fontana and – Piero Manzoni, artists were able to begin from a zero point, working outside formal limitations. 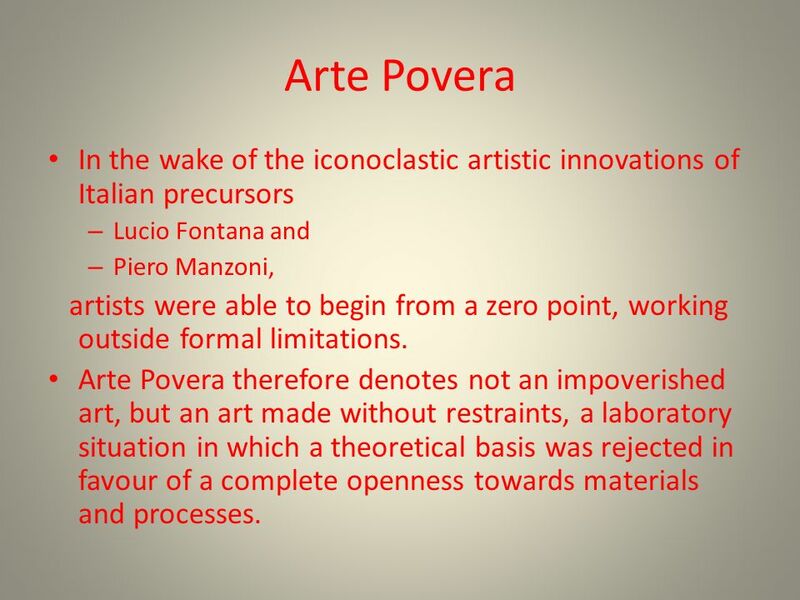 Arte Povera therefore denotes not an impoverished art, but an art made without restraints, a laboratory situation in which a theoretical basis was rejected in favour of a complete openness towards materials and processes. 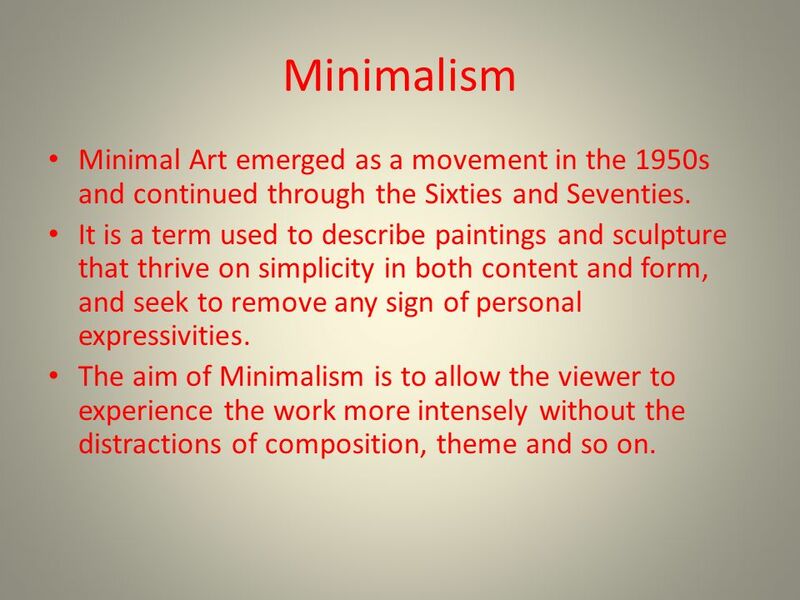 25 Minimalism Minimal Art emerged as a movement in the 1950s and continued through the Sixties and Seventies. It is a term used to describe paintings and sculpture that thrive on simplicity in both content and form, and seek to remove any sign of personal expressivities. The aim of Minimalism is to allow the viewer to experience the work more intensely without the distractions of composition, theme and so on. 26 Minimalism From the 1920s artists such as Malevich and Duchamp produced works in the Minimalist vein. The movement is known chiefly by its American exponents such as – Dan Flavin, – Carl Andre, – Ellsworth Kelly and – Donald Judd who reacted against Abstract Expressionism in their stark canvases, sculptures and installations. 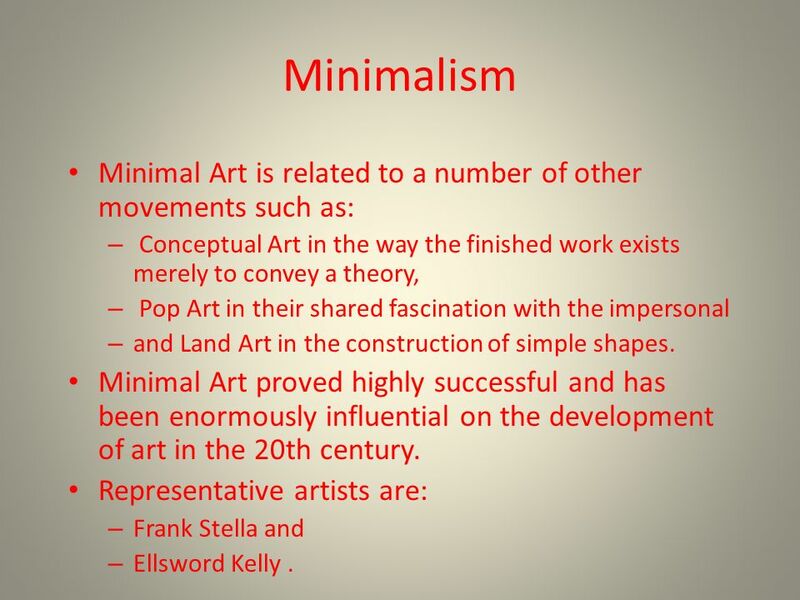 27 Minimalism Minimal Art is related to a number of other movements such as: – Conceptual Art in the way the finished work exists merely to convey a theory, – Pop Art in their shared fascination with the impersonal – and Land Art in the construction of simple shapes. 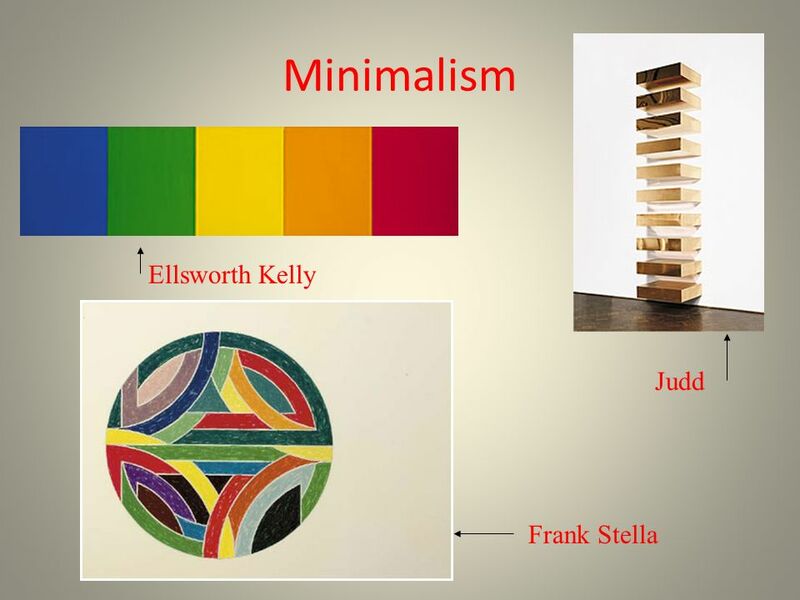 Minimal Art proved highly successful and has been enormously influential on the development of art in the 20th century. 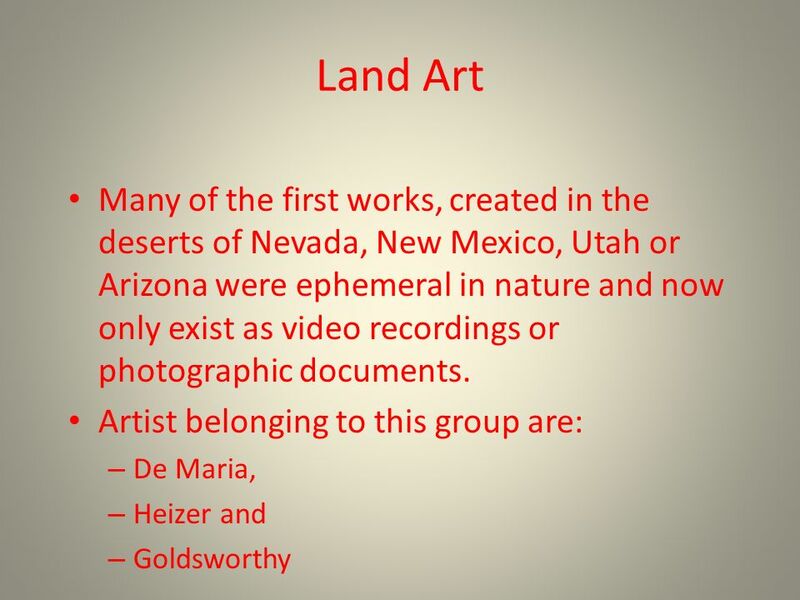 Representative artists are: – Frank Stella and – Ellsword Kelly. 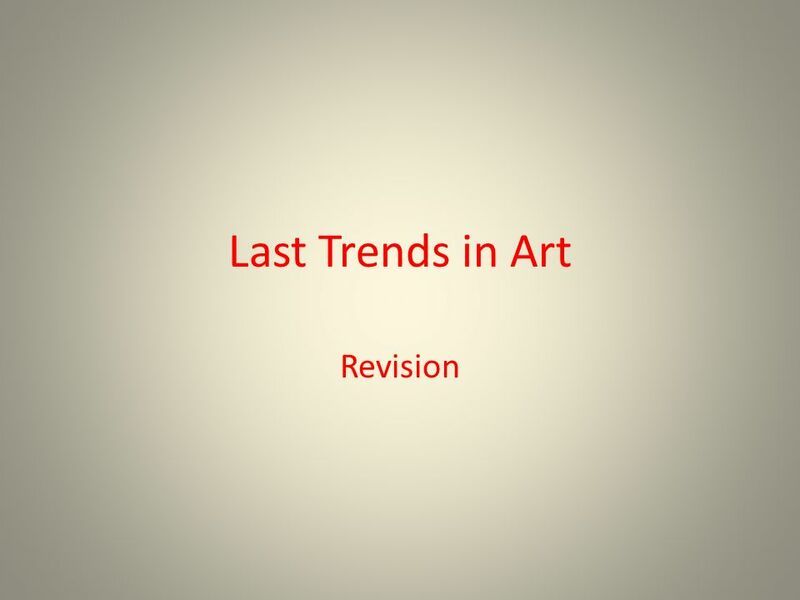 Download ppt "Last Trends in Art Revision. 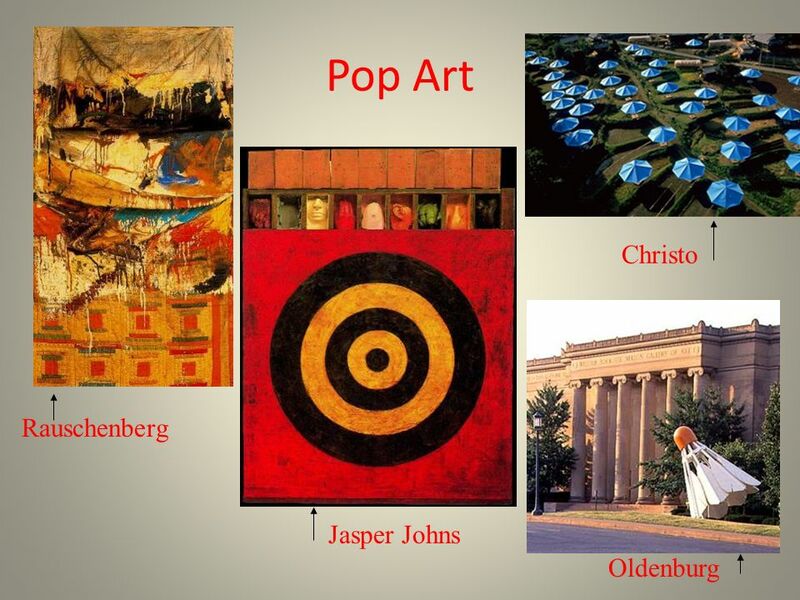 Movements From mid century and on several Art movements appeared, among them: – Pop Art – Op-Art – Kinetic Art – Graffiti." Pop Art. Andy Warhol. Campbell’s Soup Cans MoMA Pop Art Theme Let’s look at Campbell’s Soup Cans by Andy Warhol. TWO-DIMENSIONAL DESIGN Unit 3. Positive and Negative Space Space is an Element of Art created simply by drawing an object on a page. Positive space is. Pop Art by Stephan Jules. Origins of Pop Art ●In 1952, artists in London regularly came together to discuss mass culture’s place in fine art, the found. Pop Art Once you “got” Pop, you could never see a sign the same way again. And once you thought Pop, you could never see America the same way again. --Andy. 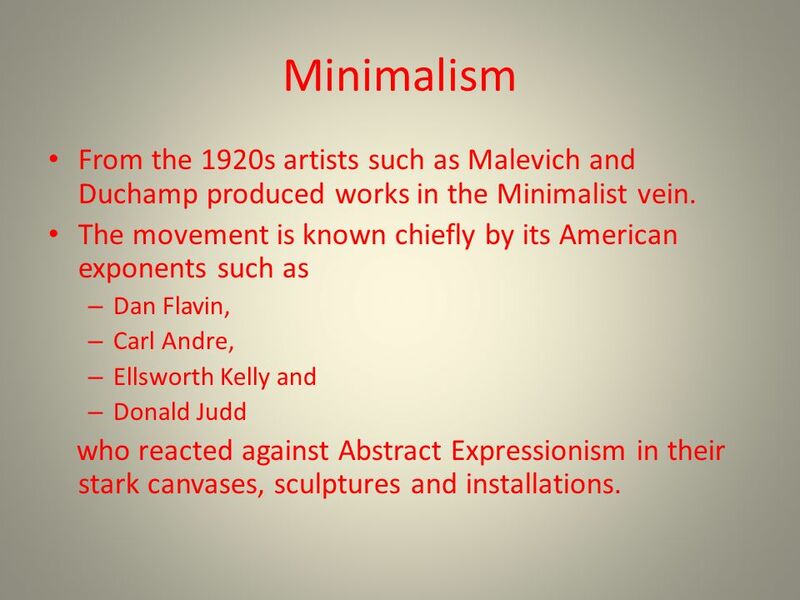 Minimalism Art Movement Mid-20 th Century. identity of a subject is exposed through eliminating all non- essential forms, features or concepts. Most economical. Artists Who Inspire: A Collection of Various Artists and Artistic Styles You will be selecting an artist/ artist’s style to research and utilize for your. 8th Grade Graffiti Tag design & lettering Objectives Examine sources of ideas and make connections between ideas and visual expression Become aware of. Graffiti Art A Quick History. Graffi ti Art Mr. Hobbs. 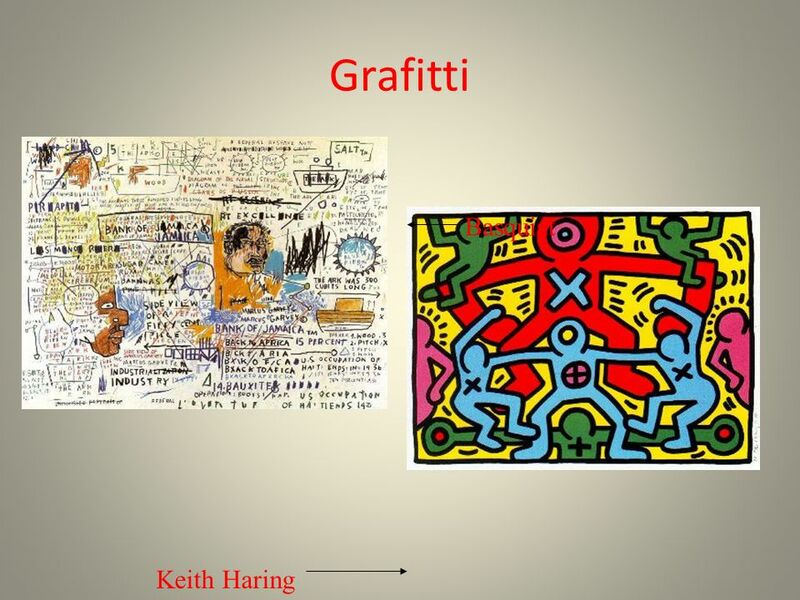 What is Graffiti?  Graffiti art doesn't just mean art we see sprayed on walls. In fact, graffiti art has such strong characteristics. 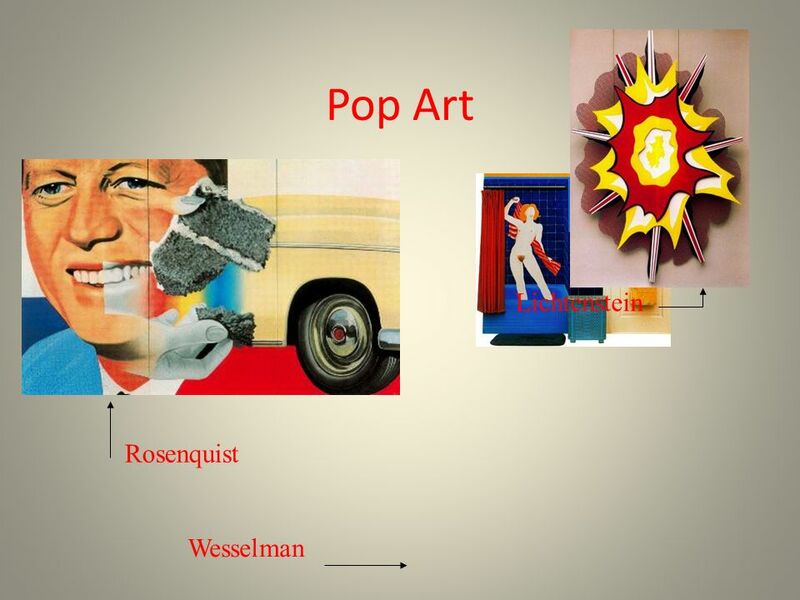 Pop Art Art based on modern popular culture and the mass media. Had its origins in England in the 1950s and made its way to the United States during the. Pop Art Mid 1950’s By: Savannah Ott & Destini Spencer. JUST PATRICK Pop Art. Rise of pop art Originated in England in 1950s The movement of pop art was most successful in USA Pop artist embraced the post ww2.